This panel bed showcases a contemporary and transitional style perfect for the modern bedroom setting. 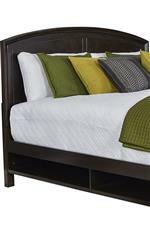 Crafted from select hardwoods and cherry veneers, the bed displays an elegant curved, panel headboard. A simple yet stylish centerpiece, this timeless bed will serve you well for years to come. 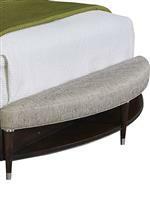 The Vibe Queen Panel Bed by Broyhill Furniture at AHFA in the area. Product availability may vary. Contact us for the most current availability on this product. 4257-450 Queen-King Wood Side Rails 1 82" 2" 7.75"
4257-251 Queen Panel Footboard 1 64" 3" 19"